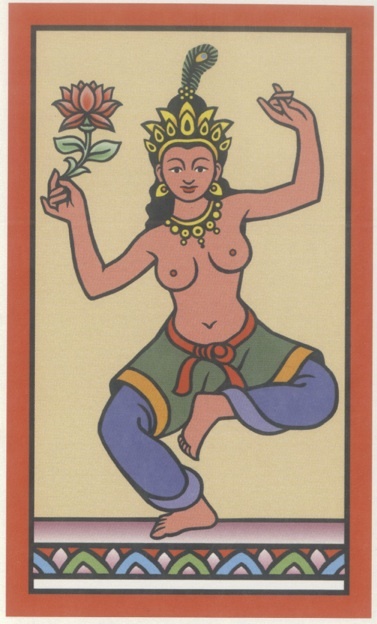 In keeping with this month’s theme of Women and Sexuality in Buddhism, I read a selection from The Buddha and the Goddess, by Rick Fields at last night’s Hi-Pointe Sitting Group. walking without arriving anywhere or having any thought of arriving or not arriving. transparent as the dew on a lotus flower–the Goddess appeared quivering like a humming bird in the air before him. She, for she was surely a she, as the Buddha could clearly see with his eye of discriminating awareness wisdom, was mostly red in color, though when the light shifted, she flashed like a rainbow. Her long his was deep blue, her eyes fathomless pits of space, and her third eye a bloodshot song of fire. With that the Buddha sat, supple as a snake, solid as a rock, beneath a Bo tree that sprung full-leaved to shade him. It goes on from there, but you get the gist.